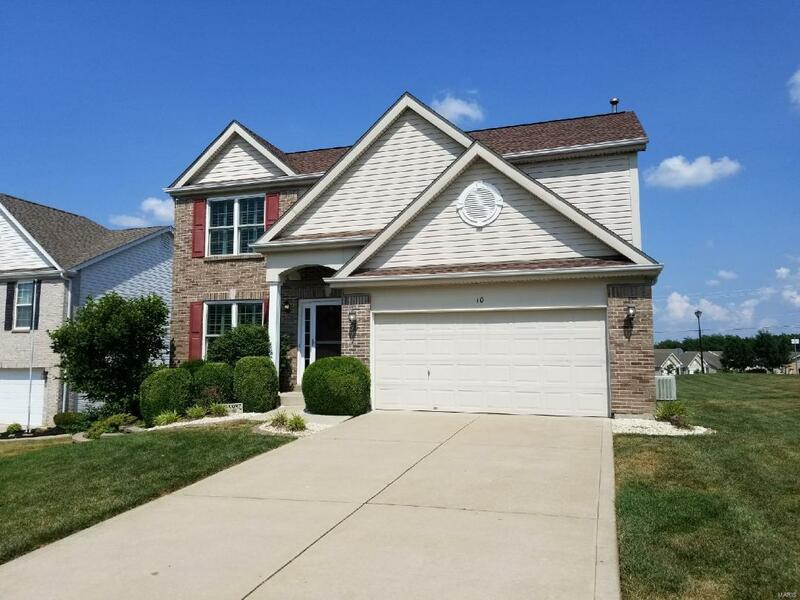 This 4 bedroom, 2.5 bath, 2 car garage, 2 story home in Lake St. Louis has updated kitchen and baths and is beautiful! New ceramic tile in Kitchen and bathrooms, new Quartz counter tops, new backsplash, and new Whirlpool appliances. The home sits on a cul de sac and is on the corner lot. Walk in to the entry foyer, see the beautiful wood floors and open floor plan. To the left is the dining room, straight ahead is the living room that has a gas fireplace, to the right is the updated 1/2 bath with new fixtures, floor, and lighting. You can walk out onto the patio thru the sliding glass doors. The kitchen is stunning with it's updates, and the laundry is on the main level also. Upstairs you will find the 4 bedrooms, and 2 baths. The rooms are big, the master has a walk in closet and is a suite with the bathroom attached. The bathrooms have been updated with the flooring, fixtures, and lighting. Master bath has separate shower and tub.